It’s the world’s second largest country in terms of total surface area, spanning five major time zones. It boasts the longest coastline in the world, stretching along three different oceans. A New Podcast About International and Global Marketing Is Coming Your Way! 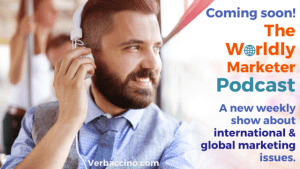 You may have heard by now that there’s a new content channel coming to Verbaccino in May 2016: The Worldly Marketer Podcast. For anyone not familiar with podcasts, it’s audio-on-demand that you can stream or download to your digital devices – radio shows, essentially, except that you can listen to them whenever and where ever you want. Beginning this month, one of those podcasts will be a weekly interview-format show featuring experts from the world of international and global marketing. We’ve all entered a digital, mobile, social age – and there’s no going back. Even as a small business, your competition is now global. Fortunately, so is your potential customer base. 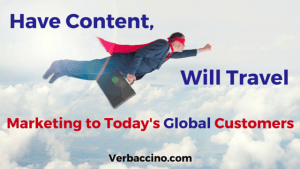 The question is: how do you approach content marketing for international audiences? Worldwide eCommerce revenues will total over $1.6 trillion USD this year – and they’re expected to keep growing. 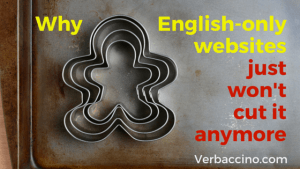 But if you’re still doing business in English only, you’re missing out. Today, nine out of ten Internet users live outside of North America. 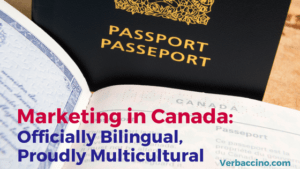 That’s why more and more eMarketers are taking a multilingual approach. 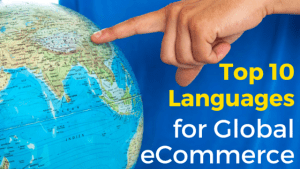 So which languages provide the best ROI for online businesses? 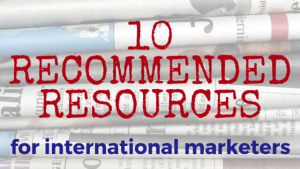 Here’s a “Top 10” list to help you go global. 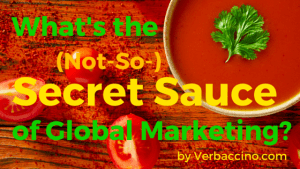 What’s the (Not-So-)Secret Sauce of Global Marketing? Today’s most successful brands know that when it comes to global marketing, translation is just for starters. Localization is the (not-so-)secret sauce that keeps your international audience coming back for more. As more and more people around the world join the ranks of Internet users, a multilingual approach will become essential. Whether you’re a marketing professional or an entrepreneur looking to grow your business, it’s smart to take an international perspective. Here are some bookmark-worthy resources to help keep you informed. Verbaccino has a clear international focus. Simply put, our mission is to help your business grow beyond its current borders. 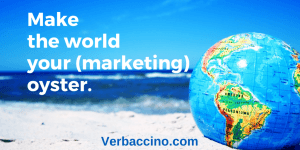 Join Verbaccino’s community of Worldly Marketers today! All rights reserved © Verbaccino, 2019.